Roy Glass, 81, of Jackson, died Friday, September 6, 2013, at the Missouri Veterans Home. 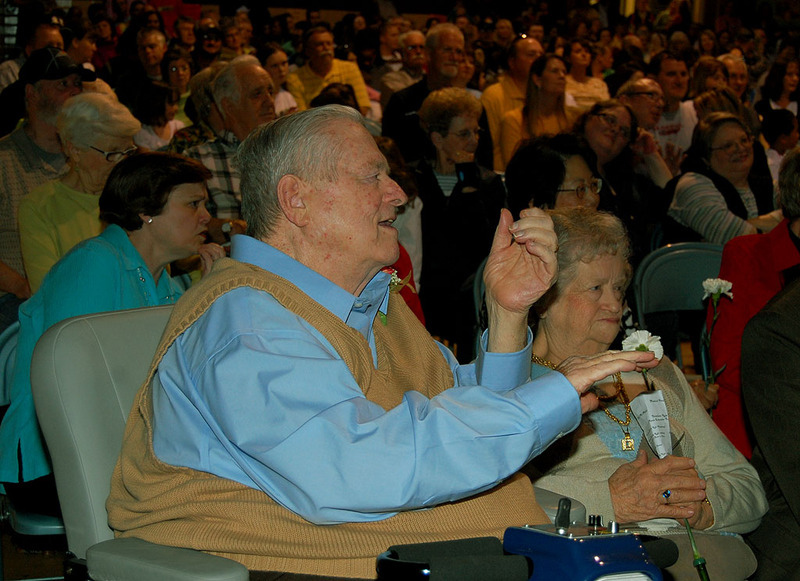 He served as principal of Alma Schrader School for 21 years. I photographed him in 2010 when the school celebrated its 50th anniversary. The Missourian’s September 8 obituary read, in part, “He was born Oct. 3, 1931, in Biggers, Ark., son of Raymond H. and Nancy Hudgins Glass. Roy was a corporal in the U.S. Army during the Korean War. Roy was an avid Cardinals fan, and enjoyed John Wayne movies and cattle farming. Survivors include his wife, Iverne Glass of Jackson; a son, Kevin (Ann) Glass of Bowling Green, Mo. ; a daughter, Marilyn (Kevin) Perego of Ballwin, Mo. ; a brother, Douglas (Yvonne) Glass of Williamsville, N.Y.; seven grandchildren, Neil Glass, Kyle Glass, Kent Glass, Jeni Glass, Andy Glass, Paige Perego and Matt Perego; and six great-grandchildren. He was preceded in death by his parents; a son, Ron Glass; and two brothers, Bill and Jim. 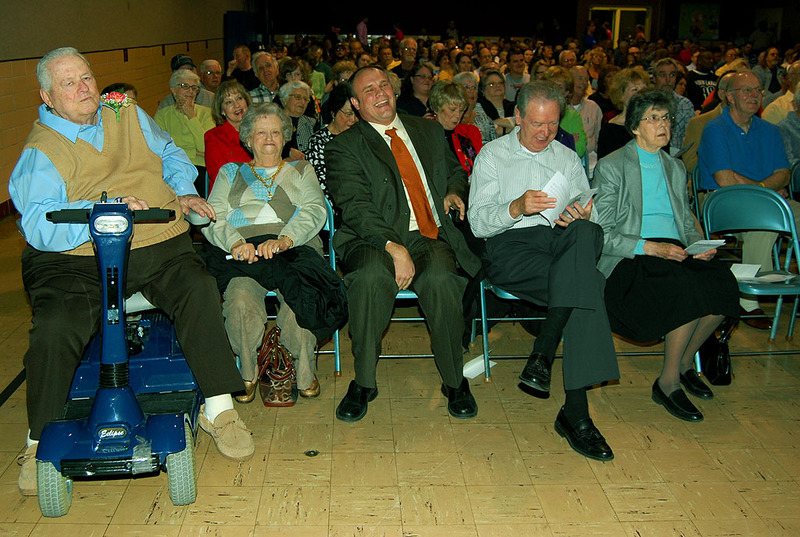 At the 50th anniversary, Roy’s grandson, Neil Glass, third from left, director of administrative services, said he used to ask his grandfather for the keys to the school so he could play in the gym when he was a kid. “I hope you don’t get in trouble for that,” he joked. “I didn’t turn on the lights,” he added. Here are some other Alma Schrader stories. I remember Mr. Glass well. I attended Alma Schrader as a 6th grader having moved to Cape from from Fayetteville, AR. I remember him as a big, tall guy who lived in a house right across the side street from the school. Schrader always brings back great memories for me as the place where our Boy Scout troop (20) met, and where I would kick a football for hours on end through the jungle gym on the Masters Drive side of the building, which was sort of shaped like goal post. It was a different time. My Junior and Senior high school years I would go over after school and the late Bill Mabrey, the Alma Schrader grade school coach would let me shoot baskets in the gym. Of course, the no lights rule did prevail. I would notify the janitor to lock the gym when I left. Mr Raddle was principal then. Sometimes, during the Alma Schrader school’s games I would sit on the bench as an observer. In the spring of my junior year, Coach Mabrey asked me if I would like to help him with the baseball team as he said he didn’t know much about the sport. I remember Van Riehl and Steve Goodson on the team but after 50 years some of the rest have slipped from my memory. I helped for two years until I went away to college to play baseball and football myself. Thanks to Coach Mabrey giving me a start, I ended up coaching baseball for over 35 years. Just another of those persons one owes so much to for their kindness and help. Alma Schrader, was not a bad place, we had some great teachers there, and of course Vince Raddle was principle. i remember him also as a no nonsense principle when he had to be. Coach Mabrey was alright, he ran a fun gym class and was funny at times. but he also was no nonsense when he had to be. Alma Schrader it still a stop when i hit Cape. Alma Schrader was the “NEW SCHOOL” when I was in school and all the the kids that lived WAY out west went there. Note to Jim Stone: if Van Riehl and the late Steve Goodson were on coach Mabrey’s basketball team, little wonder the coach wanted someone to take over the team. Roy Glass was a prince of a man. Always with a big smile on his face, a friendly greeting, and eager to help. He was a wonderful principal when our kids went to Alma Schrader. My wife Kathie was very active with the school and PTA at Schrader for over ten years, and she thought Roy hung the moon. He was also a neighbor to my parents on Janet Drive across from the school, so we saw him frequently there also. Blessings to you Roy, and thank you for all you did.